A new model provides a detailed visualization of the clustering of protons and neutrons within the excited nuclear compound formed just after two nuclei collide and fuse. Merger snapshots. Simulations reveal the clustering of protons and neutrons within the nuclear compound formed after two oxygen-16 nuclei collide and fuse (see animations below). When two nuclei collide with sufficient energy, they can temporarily fuse into a short-lived “pre-compound”—an excited-state nucleus that can later decay into a stable state or fall apart (through fission, for example). Researchers have now developed an improved theoretical approach for computing and analyzing the nuclear structures formed during this brief time. 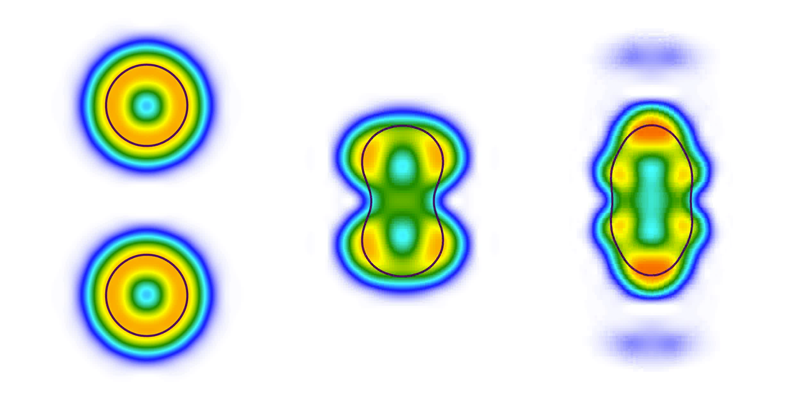 The new technique demonstrates that groups of protons and neutrons form temporary “clusters” corresponding to smaller, stable nuclei within the larger nucleus produced by the collision. Understanding the structure of this fleeting nuclear state is essential for deciphering many nuclear reactions—such as those in stars—that are often studied through nuclear collision experiments. This animation shows the fusion reaction initiated by the collision of two oxygen-16 nuclei at an energy of 20 MeV. Simulations show an oscillating structure involving two alpha clusters (red regions at top and bottom) and two deformed carbon-12 clusters above and below the center of the nucleus (light blue centers with smaller red regions on each side). The colors represent the so-called alpha-localization function, which indicates the degree to which the protons and neutrons are localized (as opposed to spread out). Localization of protons and neutrons during the fusion-fission reaction initiated by the collision of a carbon-40 nucleus with an oxygen-16 nucleus at an energy of 300 MeV. Previous theory and experiments have suggested that clusters exist within the pre-compound. Existing theoretical approaches, however, cannot reveal the detailed nature of such clusters. To address this problem, Bastian Schuetrumpf of the Technical University of Darmstadt in Germany and Witold Nazarewicz of Michigan State University in East Lansing borrowed a mathematical tool developed to describe electron arrangements within atoms and molecules and applied it to nucleons within an excited-state nucleus. The researchers analyzed reactions triggered by collisions of various nuclei (oxygen, calcium, and carbon), which can result in either fusion or fission, depending on the collision energy. The calculations reveal clusters corresponding to the nuclei helium-4, carbon-12, magnesium-24, and argon-36. For example, two oxygen-16 nuclei colliding at an energy of 20 MeV form a pre-compound whose structure oscillates between two configurations. One arrangement contains two deformed carbon-12 clusters and the other combines those clusters with two alpha particles (helium-4 nuclei; see first animation). The model could also tackle more complicated asymmetric reactions involving different nuclei, such as the fission resulting from the pre-compound formed when calcium and oxygen collide at an energy of 300 MeV (second animation).